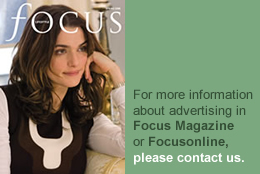 Article from FOCUS Magazine – Spring 15 issue. Let’s start with the budget – appropriate enough for a spring issue. I’m afraid the cost of a new kitchen is like the proverbial piece of string – as short or as long as your money supply, with a huge variation in prices. According to Which? Magazine, the average spend on a new kitchen is £8,000. This, however, is rather optimistic for a high-tech sophisticated kitchen in a substantial home. At a very rough estimate, you would need to spend £18,000 to £20,000 to get a good-quality branded kitchen from a kitchen specialist, to include fittings and appliances. If money is tight, however, you could shop on the mass-market, where (with careful budgeting and more personal involvement), you can buy a kitchen from upwards of £5,000. However a “designer” kitchen from a top German or Italian brand, can cost £30,000 or more – £70,000 is not unusual. But you should note that even a good quality kitchen properly installed will only add around 5 to 8 per cent to the value of your home… that’s £17,500 to £28,000 on a property selling at £350,000. In practice you would rarely recoup more than £30,000 of the money you spend on a kitchen if you were to sell your house. In general, spend your money where the wear is – appliances, taps, worktops and floors all bear the brunt of a busy kitchen. And don’t skimp on lighting – no point having it if you can’t see it properly. Here we look at some key areas of the modern kitchen, talking to experts around the trade. Colour and finishes Kitchens 2015 mix materials and finishes for an individualistic look that is far removed from the uniform fitted kitchens we saw at the beginning of the century. “Greys, blues and neutral tones won’t date and will stand the test of time,” says Matt Thomas, buyer for fitted furniture at John Lewis. 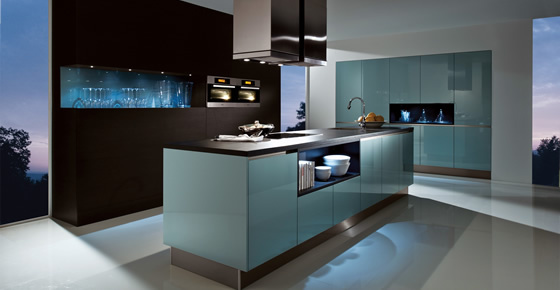 This store group provide a full service for kitchen planning, supply and install-ation, backed by ten year guarantees, and they will do interest-free credit on orders over £1,000. “Distressed” finishes are also getting popular – wood or metals are deliberately roughened to look part worn. Add a stone floor, a concrete worktop and some reclaimed wood and you get the “industrial” look. Browse your local salvage merchant for vintage pieces that add to the appeal. “Colour in the kitchen brings warmth and energy to a scheme, adds Richard Moore, design director at Martin Moore, a family-run firm, which design and build bespoke wooden kitchens. “We’re seeing basic greys and off-whites, but with accent colours, such as light blue or green. Try a stronger colour for small touches, such as a feature island, or a bright blue cupboard interior.” This creates a calm, neutral kitchen with subtle colour “pops”. Celebrating their 40th anniversary in 2015, Martin Moore were one of the very first handmade kitchen companies. Now they have seven showrooms, including one in Esher at 110 High Street (01372 465 600). Showrooms in London are in Fulham and Notting Hill (0845 180 0015 www.martinmoore.com). Kitchens from Martin Moore start from £35,000. Kitchen islands In days gone by, a kitchen would have a table in the middle. Now the trend is for a kitchen “island” – simply a freestanding block of storage units, topped by a work surface with maybe a hob and/or a sink, and a table-top for eating. “Yes, we are supplying many distinctive, bespoke, freestanding central islands,” says Woodstock Furniture’s managing director and chief designer, Andrew Hall. “An island is a focal point with extra preparation space and seating.” It’s part of a reaction to fitted furniture that includes open shelving and dressers, he adds. Woodstock design and make kitchens in their Hampshire workshops, and have a London showroom at 17 Park Drive, SW14. Make sure an island has room for access. Leave a walkway of 1200mm all around, so two people can pass comfortably. More sophisticated islands will require electrical connections, and probably plumbing and maybe gas. A good kitchen designer will take care of all these points. Free-standing appliances such as big American-style fridge freezers and standalone wine cabinets are also a break from the fully-fitted look. 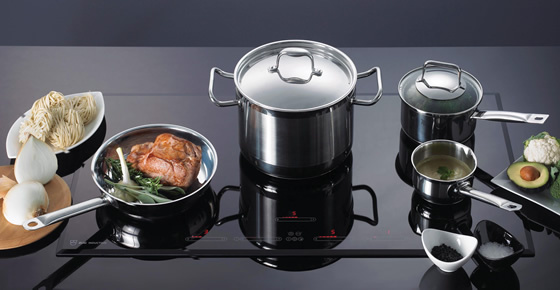 Induction hobs A new generation of induction hobs is sleek, flat and well-suited to the streamlined look of the modern kitchen. 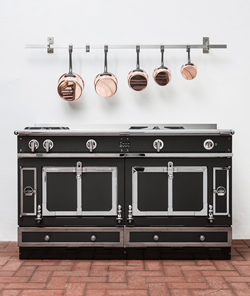 This newest type of cooker heats the pan and its contents rather than the cooking surface – but the pan must be magnetic, which in practice is cast iron or stainless steel. These hobs are energy-saving, quick to heat up, and respond rapidly to controls. Remaining cool to the touch, they are particularly safe for the elderly and young people. Food does not burn onto their surface, so they are easy to clean. Look for touch controls, rapid heat-up times, exact temperatures and a power boost to boil water rapidly. Latest models are packed with such sophisticated features. Take as a top-of-the-range example the Miele KM6356 – which admittedly is expensive at £2,950. This advanced induction hob has nine power levels with booster functions for all cooking zones, pan “recognition”, and a keep warm setting. It comes with a wok which has its own cooking zone and the precise temperature control is great of course for stir-fries, but also for risottos, soups and delicate sauces. Other features include “PowerFlex” that can combine two individual zones for, say, a large casserole. 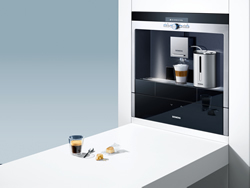 The Siemens stainless steel fully automatic bean-to-cup coffee centre is available from Wooden Heart Weybridge. Or for maximum flexibility you could fit Individual hob units which include not only a choice of gas and electric hobs, including induction, but also barbecue grills, tepanyaki and fryers. You can build a cooking system to suit your wishes and space, separating cooking areas if necessary. Steam ovens Steam ovens are a new way of cooking, and UK cooks are loving it, inspired by professional chefs such as Heston Blumenthal. Steam are fast, precise and extremely reliable. Cooking can be less stressful and your time freed up for other things. And steam cooking is excellent for nutrition. Compared to other cooking methods, vitamin content can be around 22% higher, with 36% less fat. A combi-steam oven suits most people, he says, as you get the benefits of steam cooking, along with the best features of a standard oven, cooking for the most part with steam, and then switching to the more conventional features to brown meat or add a golden crisp to a cottage pie, for example. V-ZUG’s combi-steam ovens come pre-set so it’s really simple for the user. So where does the steam come from? Well, a steam oven or combi-steam oven needs a water supply. Some models can be plumbed in, but most people choose an appliance with a refillable water tank. Make sure a water tank is large enough to work for a good length of time without a refill. Because steam cooking is so very precise it’s great for cooking meat. Steam is also ideal for reheating food, keeping it moist and preserving the texture. You can prepare big family meals or dinner parties in advance and simply reheat when the time comes. Steam can also be used for baking. A combination of steam and hot air will make bread, rolls and even puff pastries – well-risen, light and golden. Built-in waste disposal In theory, from the beginning of this year, councils were required to provide a rubbish collection which separated metals, plastic, paper and glass – although they can make the excuse that this is not “technically, environmentally or economically practicable” (known a bit arcanely as TEEP). Food waste, too, should be collected in a separate container. In practice all councils have different ways of collecting their waste, which can be bewildering for a homeowner. Worktop food caddies are often provided by councils, but many households dislike the mess and the smell. An electric waste disposal unit fitted in a sink (from around £70-£350, plus fitting) can ease the problem. But the growing trend is towards built-in waste bins. “Yes, clients are now asking for built-in bins near food preparation areas, plus additional bins for the rest of their waste,” says kitchen experts Nicholas Anthony, of Wigmore Street, W1; 020 7486 7615; nicholas-anthony.co.uk. Adds Steven de Munnich, design director at Smallbone of Devizes: “Bespoke and innovative storage can make use of even awkward areas and utilise every inch of space. Pull-out drawers are so much easier to use than cupboards, and can be customised to store a wide range of items. Pull-out rubbish bins can be hidden away, and can be removed for cleaning. They can be tailored to local waste, recycling and composting requirements.” A client of Smallbone requested special bins with pop-up lids to suit their council’s refuse-collection regulations. Now they can recycle four different materials: household waste, mixed recycling, glass bottles and jars, and compostable waste. The Smallbone flagship showroom is at 220 Brompton Road, Knightsbridge, SW3; 020 7589 5998; smallbone.co.uk. Complete kitchens cost from £40,000. “Totem” is a smart new system for what its makers, twin entrepreneurs Joseph Joseph, call “intelligent waste”. Super-sized bins have dividers which can be arranged to collect different types of waste. Words of wisdom Whatever the newest trends in looks and appliances, there are some kitchen fundamentals that remain unchanged. Buy from a personally-recommended and well-established kitchen specialist, and visit at least three before making a choice. Ask for references to previous clients, and if you can see past work. Ask if your kitchen company belongs to a reputable trade association, and if and how your deposit is protected. Check out guarantees. How long are they for? Are they for parts and labour, or just parts? Check carefully who will do what work – firms vary widely on what they undertake and for what they accept responsibility. So check all estimates. A total price usually includes carpentry, plumbing and electrics, but possibly not building work, flooring, tiling or decoration. Check plans and specifications minutely – later mistakes will be expensive. Structural alterations may require approval under building regulations – in the first instance, check with the planning department of your local authority. Gas fitters must be on the Gas Safe Register (www.gassaferegister. co.uk) which has replaced the CORGI scheme. Electricians should belong to a government-approved body (eg ECA or NICEIC).